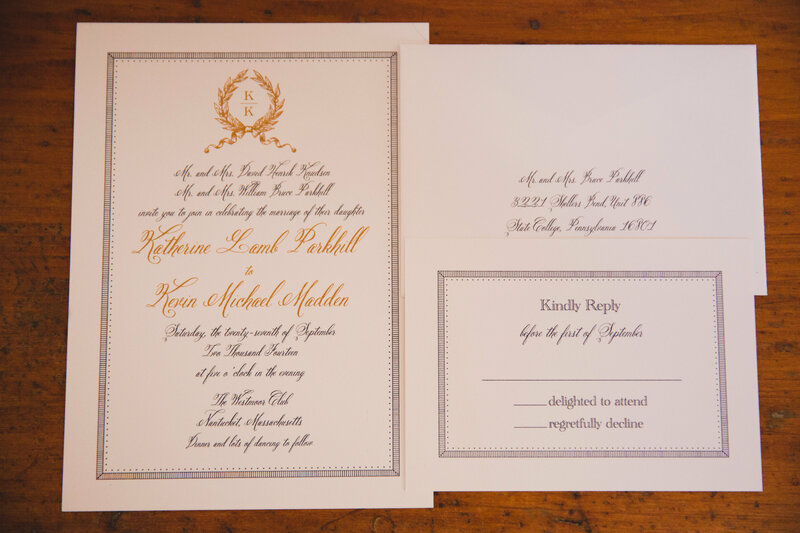 Just like “the one” (in this case, that would be Kevin), bride Kate says that when it came to selecting a wedding invitation, she “would know it when she saw it.” And, well, she did. It was a Crane invitation with a beautiful gold crest, elegant navy script and delicate frame. 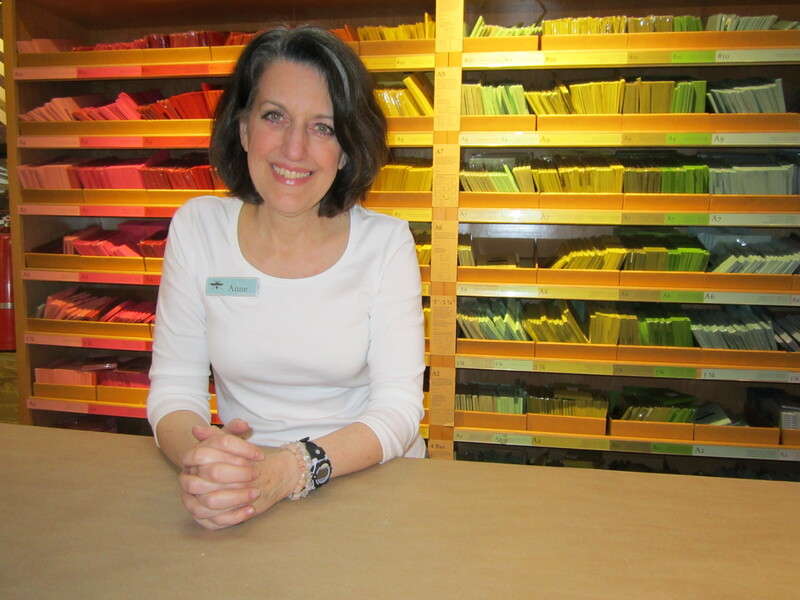 Anne, manager of Paper Source’s SoHo location, helped with the process. Here, they talk to us about proposals disguised as lobster rolls, the importance of time frames, and the special details that make the big day. View a similar wedding invitation design to Kate and Kevin’s. We got engaged July 14th 2012 at dusk in Southampton. We were in the Hamptons for a relaxing weekend with our dog, and Kevin convinced me there was a pop up lobster roll shop on the beach (he knows I will do anything for a lobster roll). We got to the beach, and as soon as I realized there was no restaurant, I looked over and he was down on one knee. We have a picture of us that was taken at the very same beach from the summer before, and he wanted to recreate the scene. Now we go back each year and take a picture at dusk—a very sweet and special tradition. Tell me about the process of choosing your wedding invitations—did you have something in mind and did that change? I knew that I wanted the invitations to be timeless, elegant and to set the overall tone for the wedding weekend. I knew that I wanted metallic gold, navy script and a crest or a border of some kind. I have very particular taste, and knew that I would “know it when I saw it”. I was thrilled when the suite that I picked was from Crane. According to my mom, my grandmother loved Crane. She would have been delighted that I went with such a classic and well-crafted brand. I fell in love with the border of the suite I chose—it was exactly what I was looking for. It had dots and a striped line border that fit in perfectly with the preppy feel I wanted. I loved that I could customize the suite, and I chose a beautiful gold crest that gave the elegance and timeless quality that I was looking for. I knew that it would set the tone for the weekend perfectly. I have the suite framed in my office as a beautiful reminder of our magical weekend. One of the hardest parts was selecting the various script fonts. I didn’t want the invitations to be too formal, but I also wanted them to be elegant with a hint of prep. With so many font choices, it was overwhelming at times! I would advise brides to gather a few words that sum up the feel you want your wedding to evoke. With those in mind, it can really help to narrow down the choices when browsing through the countless books. 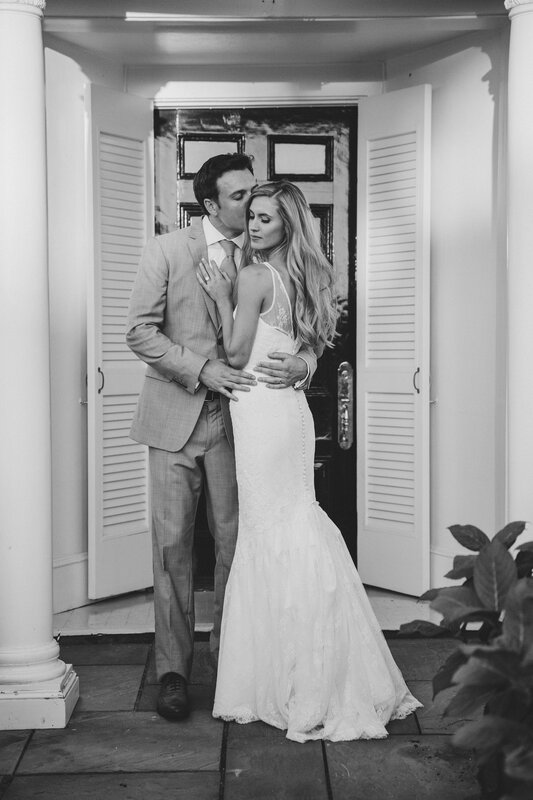 What were some of the special details from your wedding day? My vision for our wedding was the marriage of seaside prep meets English cottage garden. Since we chose Nantucket, this came naturally. I really wanted to let the island charm shine through without being overtly “nautical”. I chose a color palate of navy and peach with accents of antique silver and gold. We wanted the wedding to be relaxed and fun with the focus being time spent with our loved ones on a paradise island. 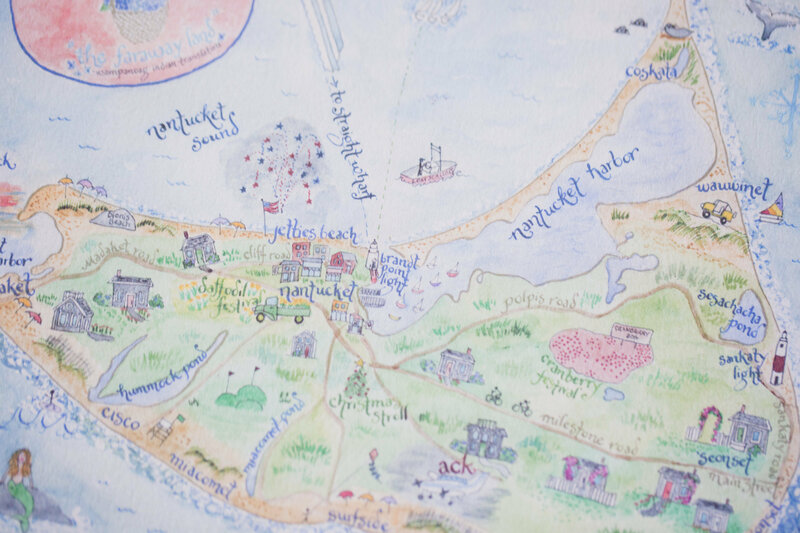 We chose Nantucket because it is where we really fell in love. We first said “I love you” there and when the discussion of wedding locations came up, we both knew it was where it had to be. We loved the idea of sharing what is such special place to us, with our loved ones. 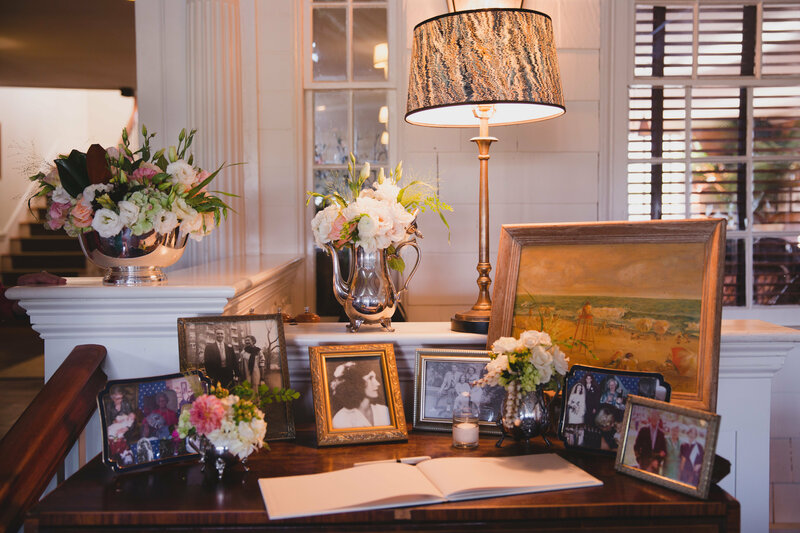 The guest book was surrounded by pictures of parents, grandparents and other family members on their own wedding day, which added to the sentimental feel of the reception. 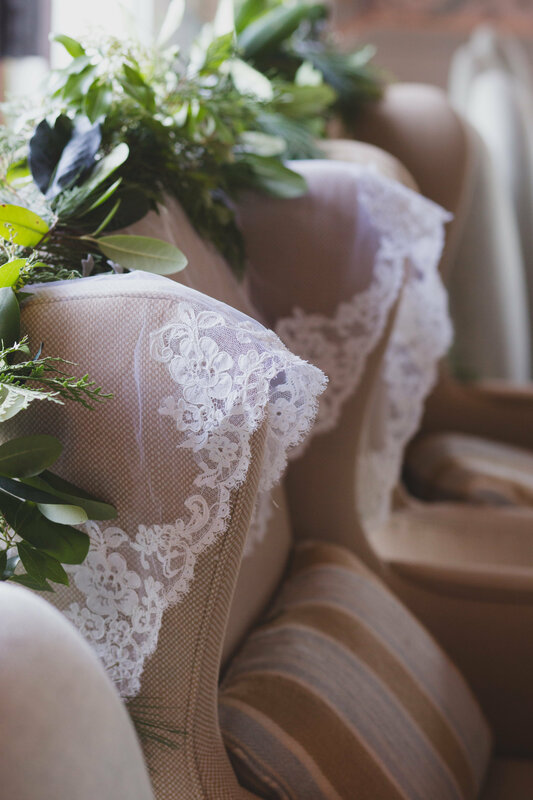 The bride’s chair was adorned with her mother’s bridal veil. The wedding favor was a hand-stamped bag filled with late night snacks and drinks along with a keepsake custom hand-painted watercolor map of the island. 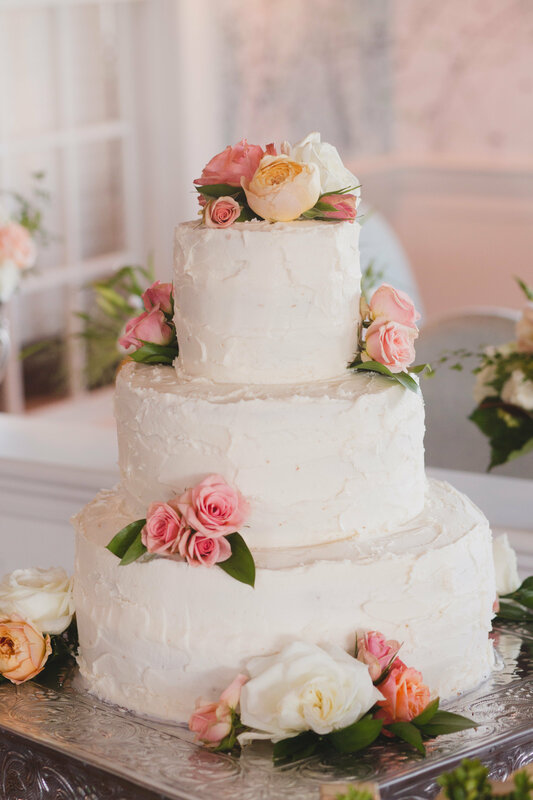 I knew I wanted a very simple cake with fresh flowers. And I wanted it to taste delicious! My mom makes the most delicious lemon raspberry cake so I had the wild idea of asking her to bake it. (She is not a professional baker.) She was up to the task and made the most delicious masterpiece in the kitchen of the home we had rented for the week. Tell me about working with Kate and about the process you went through to get to the final decision. I wasn’t involved in the earliest part of the process but I know she was looking for something more traditional when she started. She looked through several books, but when she saw this invitation suite she knew pretty quickly it was what she wanted. Kate loved this suite so much that she ordered pieces to match it for her reception. Kate extended the color theme and style from the invitations to her menu and even the place cards she made for the reception. I always start the conversation asking the date of the wedding and congratulating the bride/couple. Then we work into whether they have looked at invitations yet and whether they have a style in mind. Once we touch on invitations, I ask what other parts of their wedding they’ve completed or thought about: do they have a dress picked out? A venue? Have they picked their colors? I try to collect as much information as possible to help determine where we’ll start in their search for the perfect invitation suite. It’s also important to know what kind of time frame we’re working with. This allows me to manage their expectations about what is realistic within that time frame as early in the process as possible. What are some of the big invitation design trends you’re seeing these days? This year is more about gold metallic than last year was. Our brides are very into foil invitations with gold foil by far the most popular foil color. We have more interest this year than past years in gilded edges and metallic thermography or engraved printing. We’re also seeing an uptick in brides and grooms wanting some sort of design (or motif) element on the invitation. Before the text of the invitation was all they wanted on the card. More and more brides and grooms (and their mothers) are more comfortable with including the wedding Web site directly on the invitation. As recently as two years ago, most customers wouldn’t dream of including that on their invitation. More couples are paying for all or most of their wedding, so they are moving away from the traditional wording in which the bride’s parents extend the invitation to the wedding. More people are using wording like: “Together with their parents” or the couple extends the invitation. If the appointment is to consider invitations for the very first time, I tell them to look first for components that they love. I explain that it can be overwhelming to find the perfect invitation. They should start narrowing down the field by identifying elements that really resonate with them. I also tell them not to worry if they are looking as a couple and they don’t agree at first. Inevitably they will find elements they both love and then will be able to find the invitation they love. Another important piece of information I share is to start looking at the different wording that is out there. This way they can piece together a sentiment they love without the pressure of having to figure it out by themselves. When it comes to choosing wedding invitations, how are today’s brides different from those five years ago? Brides today lean a little more casual than they did five years ago. It may be that everything from the paper color to the font selection to the print method is casual. It may be something as small as an unexpected ink color. In addition, they are more involved in selecting their fonts and colors than they used to be. Five years ago, most brides went with the whole suite from a book including whichever fonts and ink colors were featured. Now they mix and match fonts and study every color possibility before making their decision. Far more grooms are involved with the decisions about the invitations than ever before. While they used to visit the store with their bride, most grooms used to say that they would be fine with whatever the bride wanted. Now more of them have very specific opinions about the text and sometimes about the design of the invitation. Special thanks to Gina Brocker Photography for providing Kate and Kevin’s lovely images. If you are a bride or a retailer who would like to have your Crane wedding invitations featured in our Real Weddings series, please email us at submissions@crane.com.